1.Classic Movies in Miniature Style. As part of his graduation thesis, Murat Palta decided to blend traditional oriental motifs with contemporary western films. Pop culture art is a favorite. Particularly when it features such delights as Star Wars, Inception, and Kill Bill. 2. The Popcast. 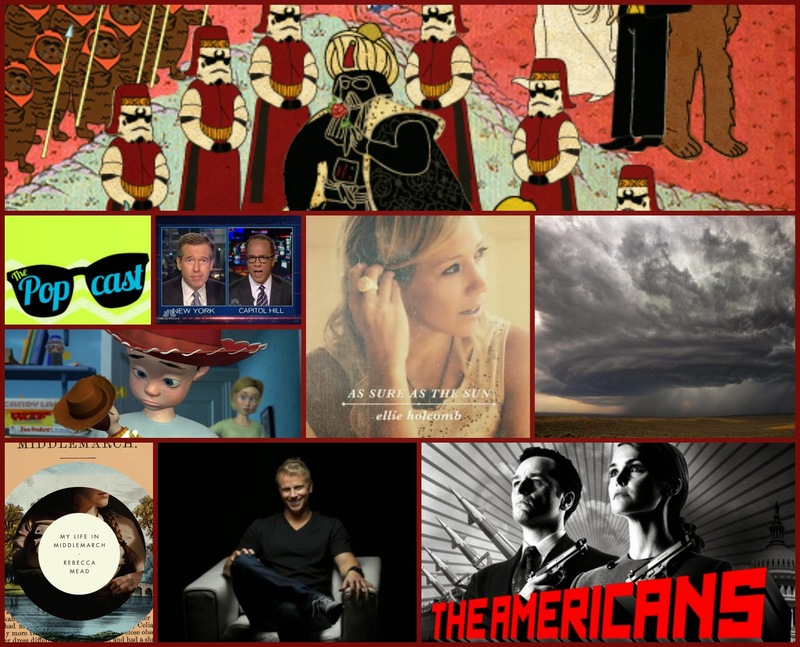 This month on our pop culture podcast, Knox and I tackled the Olympics, Phillip Seymour Hoffman, House of Cards, Jimmy Fallon, Pharrell, Valentine's Day, True Detective, The Oscars, Alec Baldwin, Canada, Seth Meyers, Boycotts, The Super Bowl and much more. 3. Rapper's Delight. The Tonight Show with Jimmy Fallon debuted this month. Jimmy's wheelhouse is viral video content. Don't hesitate to check out his Lip Sync Battle with Paul Rudd or The History of Rap 5 with Justin Timberlake. My personal favorite is Brian Williams' Rapper's Delight. 4. Pixar Theory: Last summer, Jon Negroni wrote a great piece called A Grand Unified Theory of Pixar which hypothesized all the movies were connected in one cohesive timeline. It's a fascinating read. This month, Negroni put forth my favorite theory: Andy's Mom in Toy Story is Jessie's Previous Owner. Perfect. 5. Ellie Holcomb: I've always enjoyed the music of Drew Holcomb & The Neighbors. Drew's wife (and one of the "neighbors") Ellie Holcomb released her first full-length solo album this month, As Sure As The Sun. It is special. Not only was it a Kickstarter baby, but it's good music. Each song is like a page torn from a journal of a person wrestling with God and faith and trust. It hit home. 6. Stormscapes. I live in "tornado alley" in a city full of trees so it's rare to see the beauty in storms. Last summer, Nicolaus Wegner camped out in South Dakota and Wyoming and captured thunderstorms and supercells at their fanciest. 7. My Life in Middlemarch. Rebecca Mead writes a book that's part memoir, part literary criticism and part Eliot biography. This exquisite novel made me fall in love with that high school required reading and believe it to be more than I recall. 8. Sean Lowe's I Am Second. I'm a fan of this particular Bachelor. His video and Annie Downs' take on it confirms why. 9. The Americans. In the aforementioned Popcast, Knox has tried without fail to have me fall for this 1980s cold war spy drama on A&E. I finally caved when the first season went up on Amazon Prime. After a 4 day binge, I was completely hooked. The KGB is just a wallpaper for this tumultuous drama about a marriage in crisis. So good. Not suitable for all grandmothers. But I believe that everyone in the world wants to be with someone else tonight, together in the dark, with the sweet warmth of a hip or a foot or a bare expanse of shoulder within reach. Those of us who have lost that, whatever our age, never lose the longing: just look at our faces. If it returns, we seize upon it avidly, stunned and altered again. 11. Unlikely Simultaneous Historical Events. A list that will make you furrow your brow. Includes: The first wagon train of the Oregon Trail heads out the same year the fax machine is invented. Frozen: A cautionary tale about isolating an extrovert based on the special needs of an introvert sibling. Life is 10% what happens to me, 75% how I handle it, and 15% how I share it on social media. Note: I included this because each of those pairings is truly the most romantic. And I was proud I knew them all. Ironically, the more camo you wear, the more people see you. Twitter: where we gather to complain about our Facebook friends. Linking up with the delightful Leigh Kramer to share what I loved in February. What did you fancy last month?